When was the last time you saw a dirty swan? On March 22nd at Turnbull National Wildlife Refuge I was thrilled to watch this Trumpeter swan diving underwater and then doing barrel rolls at the surface of the water. Swans are so buoyant I am amazed that most of their body can be underwater! When it popped up out of the water it repeatedly slapped its wings on the water for lots of splashes. I couldn’t help but think that not only was it getting a good bath but it was having fun doing it! After it warmed up from a cold, icy winter, I decided to go out to Turnbull National Wildlife Refuge to see if migration was happening. To my delight, I counted 15 swans coming through that day. There was a family of 6 Trumpeters that were bathing in the water and then taking turns coming up on a small patch of ice to finish preening. I captured this image of an adult swan looking right at my camera, which I thought was humorous! At the same time its cygnet was stretching its mottled tan and white wings. Soon the cygnet will be pure white! What a special time to watch all the swan activity that day! HOT SPRINGS VILLAGE, ARKANSAS: Hot Spring "Village bird watchers have had a rare treat the last week or so. HSV Audubon received a call on Feb. 17 that a swan had been sighted on Lake Sophia.A picture of the bird confirmed that it was a Trumpeter Swan. Even though it didn’t stay long, a Trumpeter was reported the next day at nearby Lake Maria. Read more..."
Are anglers leaving behind toxic lead in the Hamilton Harbour? In Ontario- Five dead swans in a month: lead poisoning in Hamilton Harbour? Saturday, January 26, 2019. 10:30 a.m.- 2 p.m.
Meet a swan! Activities for kids and adults! Food! Learn about the return of swans to North America as well as Iowa's special swan story; learn about wetland conservation. Get a sneak peak at the TTSS film "Return of the Trumpeter Swan" documentary film! Go on a guided field trip and learn Nature Photography 101 with hands on photo tips. Saturday programs will be both indoors and outdoors at the Walnut Woods State Park lodge. Also enjoy outdoor viewing and interpretive presentations about trumpeter swans and bald eagles given by Iowa DNR, Des Moines Parks and Rec, Polk and Dallas County Conservation naturalists. Spotting scopes and binoculars will be provided. 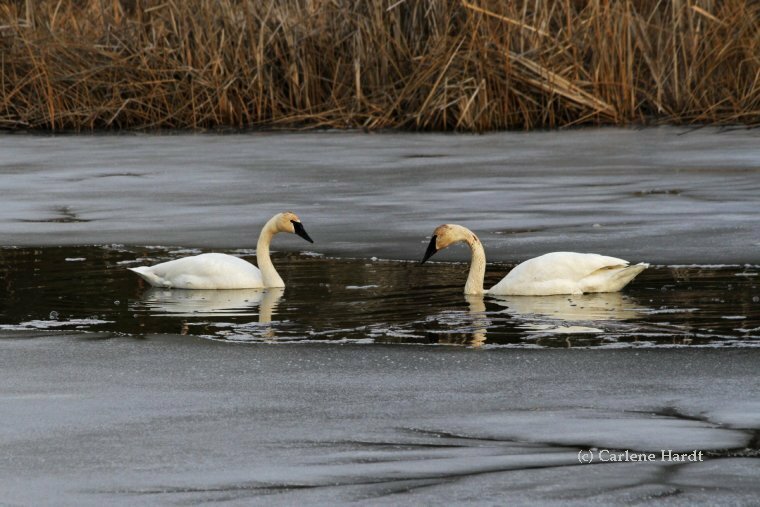 An estimated 160 trumpeter swans are wintering at the Dale Maffitt Reservoir and surrounding area southwest of Des Moines, providing a rare opportunity to view good numbers of free flying trumpeter swans. This event is being sponsored by the Iowa Department of Natural Resources, Polk and Dallas County Conservation Boards, Des Moines Water Works, Des Moines Parks and Recreation, Walnut Woods State Park, and the Trumpeter Swan Society. My Swan Story by David W.
I began working for Hennepin County Park Reserve District (HCPRD) in February, 1966. During the 1960's and early 1970's I was involved in the project to re-introduce the Trumpeter Swans to Minnesota. They had been gone from our state for about 100 years. We transported about 20 adult swans from Red Rock Lakes in the Centennial Valley in Montana. The natural habitat was a large grassy wetland, accessible by air boat. The birds were transported in cages large enough for them to walk around in comfortably. The trip home was successful and uneventful. We located the birds to an enclosed area on the edge of a small lake in Carver Park. For the next few years I fed the swans seven days a week. During periods of open water they were fed aquatic vegetation. During freeze up they received small grains, alfalfa pellets and loose alfalfa. We kept a small area of open water for the swans. It was exciting to work with these amazing birds! The fenced refuge area was about 80-100 acres. It proved to be large enough for a few nest areas. About the third year we had five cygnets hatched in the refuge. 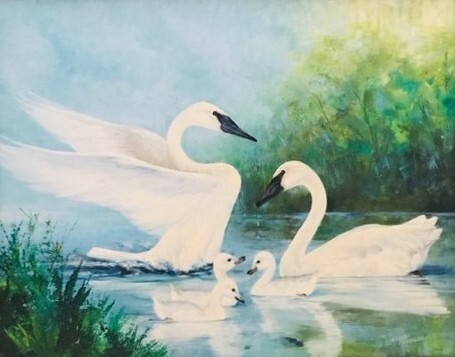 Three cygnets survived (see original watercolor painting by Sherm Pehrson). The flock was free flying and that allowed some pairs to nest outside the refuge area. The project was expanded to include wildlife specialists to better supervise overall management. 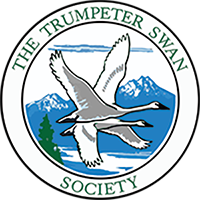 The Trumpeter Swan Society was started by HCPRD and has been a vital part of its overall success. I feel fortunate to have been a small part of the restoration project. It's a good feeling to see small flocks of Trumpeter Swans and realize I was part of this. I never tire of hearing their Trumpeting call! Jeweled sun sheds wintry light. The river snaps and sings. Behind clouds low and chill. Soon white stars will burn.